Upon exposure to immune or inflammatory stimuli, dendritic cells (DC) migrate from peripheral tissues to lymphoid organs, where they present Ag. CC chemokines induce chemotactic and transendothelial migration of immature DC, in vitro. Maturation of DC by CD40L, or by LPS, IL-1, and TNF, induces down-regulation of the two main CC chemokine receptors expressed by these cells, CCR1 and CCR5, and abrogates chemotaxis to their ligands. Inhibition was rapid (<1 h) and included the unrelated agent FMLP. Concomitantly, the expression of CCR7 and the migration to its ligand EBI1 ligand chemokine (ELC)/macrophage inflammatory protein (MIP)-3β, a chemokine expressed in lymphoid organs, were strongly up-regulated, though with slower kinetics (24–48 h). Rapid inhibition of responsiveness to chemoattractants present at sites of inflammation and immune reaction may be permissive for leaving peripheral tissues. Conversely, the slower acquisition of responsiveness to ELC/MIP-3β may guide subsequent localization of DC in lymphoid organs. Dendritic cells (DC)4 are bone marrow-derived professional APCs. Their hallmarks include the ability to capture, process, and present Ags to T cells and to selectively migrate through tissues to reach lymph nodes and spleen, where initiation of immune responses takes place (1, 2, 3, 4). It is known that DC trafficking is regulated. Bone marrow and blood DC progenitors seed nonlymphoid tissues, where they develop into immature DC with high ability to capture Ags. Immune and inflammatory signals induce mobilization of DC from the periphery to lymph nodes or spleen T cell areas and a shift from a “processing” to a “presenting” stage, characterized by an increased capacity to stimulate T lymphocytes (5, 6, 7, 8, 9, 10, 11). The current concept of the multistep process of leukocyte recruitment into tissues envisions chemotactic agonists as one of the key effector molecules (12, 13, 14). Chemokines are a superfamily of chemotactic proteins that can be divided in four groups on the basis of a cysteine structural motif. Most of the chemokines fall in two subfamilies: the α (or CXC) chemokines, mainly active on neutrophils and lymphocytes, and the β (or CC) chemokines active on multiple subsets of mononuclear cells, including DC. Lymphotactin (γ or C chemokines) and fractalkine (δ or CX3C chemokines) may define two additional groups of this superfamily (14, 15). In previous studies we and others have reported that a set of chemokines and bioactive lipids are able to induce chemotactic and transendothelial migration in DC generated in vitro either from circulating monocytes or from CD34+ cells (16, 17, 18, 19, 20, 21, 22, 23, 24, 25, 26). The present study was designed to explore how immune and inflammatory signals, which stimulate the Ag-presenting function of DC and concomitantly their trafficking to lymphoid organs, affect chemokine receptor expression and migration. Monocyte chemoattractant protein (MCP)-3 and IL-13 were a gift from Dr. A. Minty (Sanofi Elf Bio Recherches, Labège, France). MIP-1α, MIP-1β, and RANTES were from PeproTech (Rocky Hill, NJ). Recombinant ELC/MIP-3β was prepared as described (27). GM-CSF, TNF-α, and IL-1 were gifts from Sandoz (Basel, Switzerland), BASF (Knoll, Germany), and Kyron (Milan, Italy), respectively. FMLP and LPS (Escherichia coli 055:B5) were from Sigma (St. Louis, MO). DC were differentiated in vitro as previously described (16, 28). Blood monocytes (>95% CD14+), obtained by Ficoll and Percoll gradients, were purified by panning on CD6-coated plastic dishes. Monocytes were cultured for 7 days at 1 × 106/ml in RPMI 1640 (Biochrom, Berlin, Germany), 10% FCS (HyClone, Logan, UT), with 50 ng/ml GM-CSF and 10 ng/ml IL-13. CD-34+ cells were purified from cord blood using Minimacs columns (Miltenyi Biotec, Bergisch-Gladbach, Germany) and cultured for 12 days with 50 ng/ml Stem Cell Factor (Amgen Biologic, Thousand Oaks, CA), 50 ng/ml GM-CSF, and 10 ng/ml TNF. Where specified, DC were further cultured in the presence of 10 ng/ml IL-1 or 10 ng/ml TNF or 10 ng/ml LPS for 48 h or as otherwise specified. CD40L-transfected J558L cells (29) (provided by Dr. Peter Lane, Basel Institute for Immunology, Switzerland), or mock control cells, were cocultured with DC at a 1:5 ratio. DC cultured with LPS, IL-1, TNF, or activated by CD40 ligation for 48 h, expressed typical maturation markers and high APC activity. For instance, after CD40L activation, DC were >70% CD83+; >70% CD80+; MHC class II bright (mean channel fluorescence >900); and highly effective in mixed lymphocyte reaction (MLR) (e.g., at 3% APC T cell ratio, [3H]Tdr uptake was >70,000 cpm; stimulation index (S.I.) >35). Preliminary experiments confirmed that incubation of DC with the J558 mock cell line did not induce cell maturation. Total RNA was extracted by the guanidinium thiocyanate method, blotted, and hybridized as described (17, 30). cDNA probes were prepared as described (27, 30). To evaluate mRNA half-life, DC were cocultured with CD40L-transfected J558L cells or mock cells for 48 h, and then actinomycin-D (1 μg/ml; ActD; Sigma) was added for different times (2–8 h) before Northern blot evaluation (30). mRNA half-life was determined by densitometric analysis. Cell migration was evaluated using a chemotaxis chamber (Neuroprobe, Pleasanton, CA) and polycarbonate filter (5 μm pore size; Neuroprobe) as previously described (16). Cell suspensions (0.7–1 × 106/ml) were incubated at 37°C for 90 min. Results are expressed as the mean number of migrated cells in five high power fields (×100). Each experiment was performed in triplicate. Transendothelial migration was performed in polycarbonate transwell inserts (5 μm pore, Corning, Costar, Cambridge, MA) as previously described (21). Inserts were coated with human endothelial cells (EC) prepared from umbilical cord vein, grown as monolayer. 51Cr-labeled DC were seeded in the upper compartment, and chemoattractants were placed in the lower compartment. After 1 h of incubation at 37°C, the radioactivity present in the lower compartment was evaluated. Figure 1⇓A shows that immature DC migrate to ELC (also known as MIP-3β), a recently described chemokine so far considered lymphoid specific (27, 31). The potency (number of migrated cells) and the efficacy (peak concentration) of ELC for DC were comparable to those observed with other CC chemokines (Fig. 2⇓). Effect of DC maturation on chemokine receptor expression and function. Monocyte-derived DC were incubated with 10 ng/ml IL-1 or CD40L-transfected cells (CD40L; ratio 5:1) for 48 h (A and B) or as indicated (C and D) before being tested. Different concentrations of chemokines (A and B) or 100 ng/ml MIP-1α and ELC (C) were used. D, Fifteen micrograms of total RNA were purified from DC and used in Northern blot analysis. Results of one experiment representative of at least four independent cell preparations are shown. Ethidium bromide staining is reported below. Effect of DC maturation on DC chemotaxis and transendothelial migration to CC chemokines and FMLP. Chemotaxis of monocyte-derived DC (A) or CD34+ cell-derived DC (C) was performed as described in Materials and Methods. For transendothelial migration (B), polycarbonate transwell inserts were coated with a monolayer of endothelial cells. In the appropriate experimental groups, cells were treated with 10 ng/ml IL-1 or with CD40L-transfected cells (CD40L; 5:1 ratio) for 48 h. Chemokines were used at the concentration of 100 ng/ml, and FMLP at the concentration of 10−7 M.
Previous studies have shown that microbial products (e.g., LPS), inflammatory cytokines (e.g., IL-1 and TNF), and CD40 ligation induce DC maturation (1, 2, 3, 4). 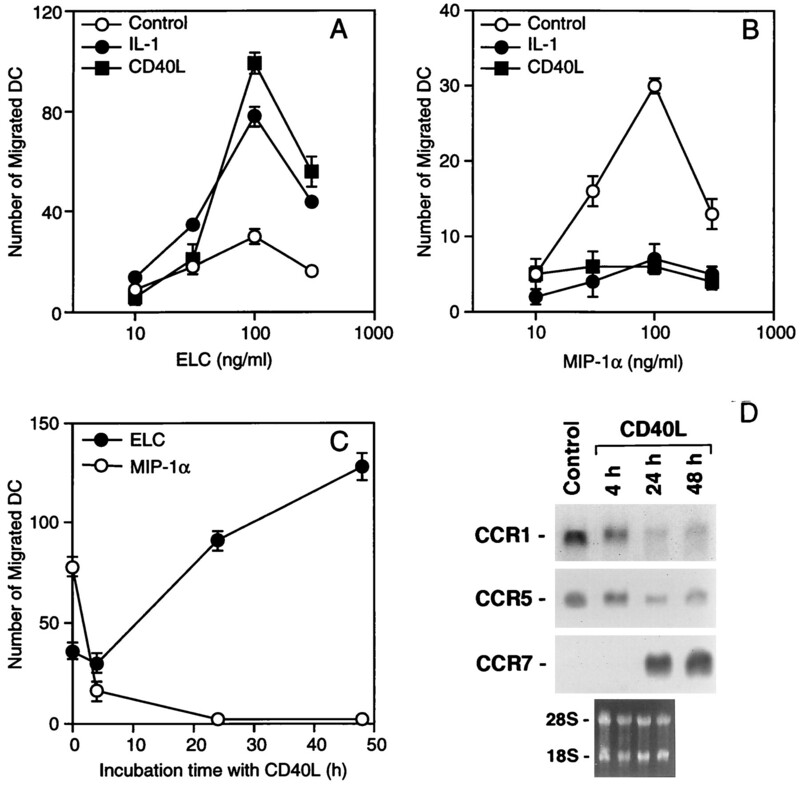 Figure 1⇑, A and B, shows that DC stimulated with IL-1 or CD40L for 48 h migrated with an increased potency in response to ELC (5.6- ± 1.5-fold and 3.5- ± 1-fold increase over control cells for CD40L and IL-1, respectively; n = 4) but completely lost their ability to respond to MIP-1α. The effect of IL-1 and CD40L stimulation on DC migration to ELC was detectable after 24 h stimulation and was maximal after 48 h (Fig. 1⇑C). In contrast, the inhibitory effect on the MIP-1α response was much faster. Both IL-1 and CD40L were already active after 1 h stimulation (>70% inhibition; n = 2), and the inhibition was nearly maximal (>80%) after 4 h (Fig. 1⇑C, and data not shown). Northern blot experiments showed that mRNA levels for CCR7, the ELC receptor (27), were barely detectable, in immature DC and after 4 h stimulation with CD40L, but were strongly up-regulated after 24 to 48 h stimulation (Fig. 1⇑D). Up-regulation of CCR7 expression in CD40L-stimulated DC was 63- ± 13-fold (n = 7; range 15- to 103-fold). On the contrary, expression of CCR1 and CCR5, the two main CC chemokine receptors in DC (17, 23), was inhibited in CD40L-treated DC, and inhibition was nearly maximal after 4 h (Fig. 1⇑D). This effect was associated with a decreased half-life of CCR1 mRNA (2.5 and 1.5 h for control and CD40L-stimulated cells, respectively). These results are reminiscent of regulation of chemokine receptor mRNA levels in monocytes centered on transcript stability (30, 32, 33). The inhibitory effect of CD40 ligation was present also when other chemotactic agonists were used. MIP-1β and RANTES, two other CCR1 and CCR5 ligands, and formylated peptides (FMLP), a prototypic bacterial chemotactic stimulus that binds an unrelated receptor, were completely inhibited after DC activation by CD40L (Fig. 2⇑A). When transendothelial migration was investigated, DC stimulated with CD40L transmigrated across endothelium in response to ELC more effectively than control cells. In contrast, the response to CCR1 and CCR5 ligands (MIP-1α, RANTES, and MIP-1β) was completely abrogated in CD40L-stimulated DC (Fig. 2⇑B). Previous studies have revealed heterogeneity among DC in responsiveness to chemokines. In particular, CCR6 was expressed only on DC obtained from CD34+ precursors and not on monocyte-derived DC, and only the former responded to MIP-3α/liver and activation-regulated chemokine (LARC)/Exodus (20, 22). Therefore, the effect of maturation on the chemotactic response of DC derived from CD34+ cord blood cells was also investigated. As shown in Figure 2⇑C, CD34-derived DC migrated to MIP-1α and ELC with approximately equal efficiency. Activation of CD34-derived DC by IL-1 or CD40L for 48 h strongly increased the response to ELC and, concomitantly, reduced the migration to MIP-1α. Similar results were obtained with mouse CD34+ cell-derived DC (A. Vecchi and A. Mantovani, unpublished observations). 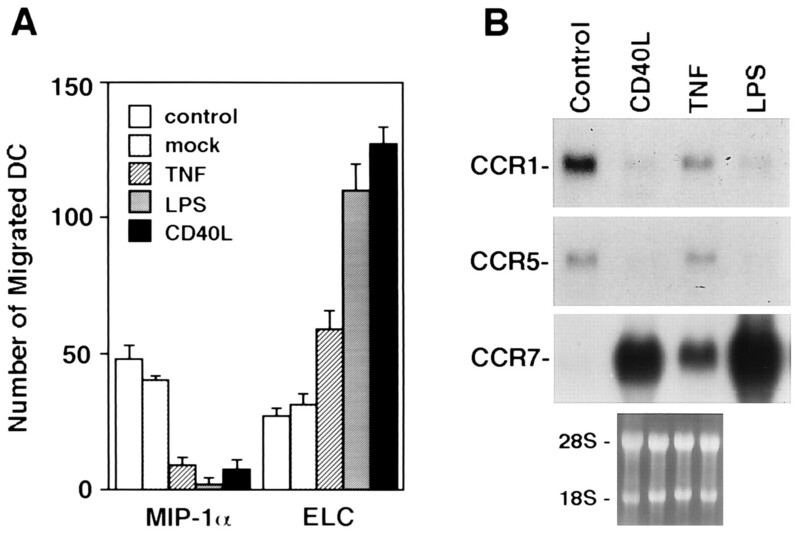 TNF and LPS, two molecules that share with CD40L the ability to trigger DC maturation, also inhibited DC migration to MIP-1α and up-regulated the chemotactic response to ELC (Fig. 3⇓A). In parallel, CCR1 and CCR5 expression was down-regulated, while CCR7 expression was strongly increased (Fig. 3⇓B). Effect of TNF and LPS on CCR1, CCR2, and CCR7 expression and function. Monocyte-derived DC were incubated with TNF or LPS (10 ng/ml), or with CD40L-transfected cells (CD40L), or mock control cells (5:1 ratio), for 48 h before being tested. A, Chemotaxis was performed as described in Figure 1⇑ using the optimal concentration of 100 ng/ml MIP-1α and ELC. B, Fifteen micrograms of total RNA were purified from DC and used in Northern blot analysis. Results of one experiment representative of at least four independent cell preparations are shown. Ethidium bromide staining is reported below. Immune and inflammatory stimuli or microbial products induce maturation of DC with acquisition of full Ag-presenting capacity (1, 2, 3, 4). In vivo, the same signals induce trafficking of DC to lymph nodes or spleen, where they present Ag (5, 6, 7, 8, 9, 10, 11). The results here presented show that IL-1, TNF, LPS, and CD40 ligation differentially regulate expression of chemokine receptors and responsiveness to their respective ligands. The same signals abrogated the chemotactic response to CCR1 and CCR5 ligands and reduced the mRNA expression of the two receptors. Inhibition of chemotaxis was almost maximal at times (<1 h) at which chemokine production (i.e., MIP-1α, RANTES, and monocyte chemoattractant protein (MCP)-1) was undetectable by sensitive ELISA (data not shown) and included also the response to FMLP, an unrelated chemotactic factor of bacterial origin. Activation of DC with IL-1, TNF, LPS, and CD40L strongly augmented the chemotactic response to ELC and the expression of CCR7, the ELC receptor. This CC chemokine, previously considered lymphoid specific (27, 31), is at present the strongest agonist for chemotaxis and transendothelial migration for DC. Interestingly, inhibition of response to the inducible CCR1 and CCR5 agonists preceded augmentation of the ELC response (see Fig. 1⇑C). These results are consistent with a “weigh anchor/hoist the sail” model, based on changes in chemokine receptors, for the trafficking to lymphoid organs of DC after Ag capture. Inhibition of responsiveness to inducible chemokines, such as MIP-1α, MIP-1β, or RANTES, would allow Ag-loaded DC to leave sites of infection and inflammation (“weigh anchor”). Conversely, the slower induction of expression of CCR7 would prepare trafficking DC to respond to ELC (“hoist the sail”), which is constitutively expressed in lymphoid organs and would be instrumental to arrest (34) and transmigration at these sites. ↵1 This study was supported by Associazione Italiana per la Ricerca sul Cancro (AIRC) and by special project AIDS (40A.0.66) from Istituto Superiore Sanità. R.B. is the recipient of a fellowship from Fondazione A. and A. Valenti. ↵2 S.S. and P.A. equally contributed to this study. ↵4 Abbreviations used in this paper:DC, dendritic cell; MIP-3β, macrophage inflammatory protein-3β; ELC, EBI1 ligand chemokine; GM-CSF, granulocyte-macrophage CSF. D’Amico, G., G. Bianchi, S. Bernasconi, L. Bersani, L. Piemonti, S. Sozzani, A. Mantovani, and P. Allavena. 1998. Adhesion, transendothelial migration and reverse transmigration of in vitro cultured dendritic cells. Blood 92: In press.